Dark Matter is a live coding project in collaboration with art@CMS involving sonification of data streams from the Compact Muon Solenoid (CMS) experiment at the Large Hadron Collider at CERN in Switzerland. Experimental data containing clues towards possible ‘new physics’ becomes the raw material for improvised music and visualisations programmed in real time by the ensemble with an aim to creating a result that while aesthetically engaging, is both musically and scientifically meaningful. 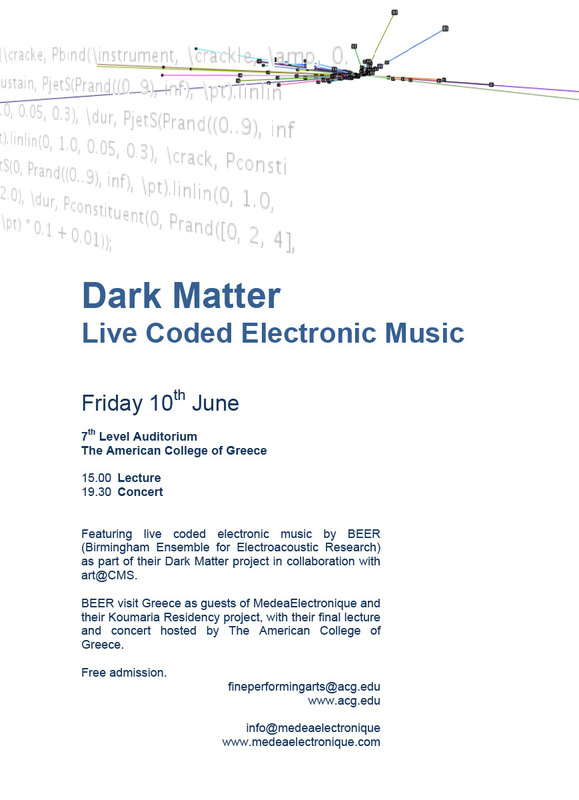 BEER will visit Greece as guests of MedeaElectronique and their Koumaria Residency project in cooperation with the Francis Rich School of Fine and Performing Arts at DEREE – The American College of Greece. The Koumaria residency will culminate in a lecture and concert on the 10th of June at DEREE. Event link here. BEER are being hosted by Medea as part of their Koumaria residency center activities (Koumaria link). The Koumaria residency is an annual ten day experimental artist residency, focusing on improvisation and new media practices, and is formulated following an open call process. Beyond this Medea use the Koumaria center for a diverse range of smaller projects and collaborations, all aimed at developing links between artists and experimenting with future creative possibilities. It is within this context that Medea welcome BEER to share and explore their innovative approach to creating sound art. The project Soundscapes Landscapes, City Above Life Below is the second in a series of digitally mediated audio-visual walks. The first project in the series has been running for the past two years at the Onassis Cultural Center (more details at http://www.sgt.gr/eng/SPG731/?). 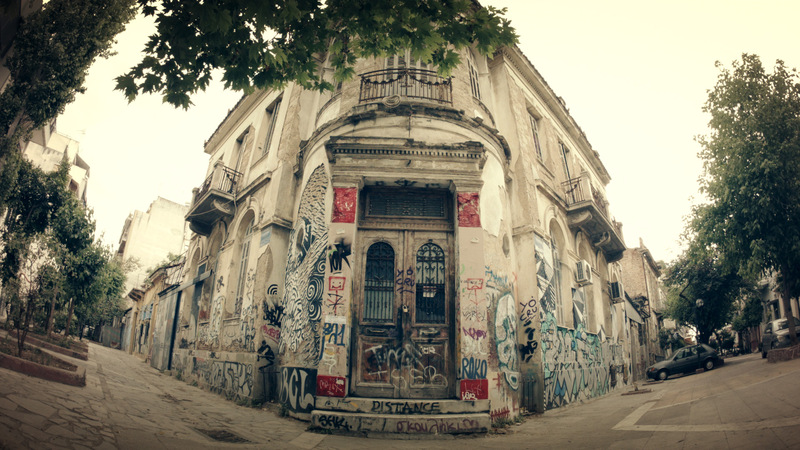 This second project will be based in a different area of Athens – KERAMIKOS – and explore new artistic and technical approaches. Medea Electronique wants to invite audio and visual artists to visit the city and create an audio-visual tour which employs a new form of artistic digital mapping. Guest artists are asked to create soundwalks, interviews, sound compositions, video art content and share it with Medea Electronique Collective in order to create a digital urban installation with artworks which draw on material from the digital mapping – the buildings, businesses and public spaces of Keramikos and the local streets – but also, behind and within all that, the people who live there, their history and their present. Starting at the Thisio, viewers armed with a special interactive digital map will be guided in real time around Keramikos a neighbourhood full of secrets, history and beauty. The project has a small budget for each resident that could be used to cover some combination of transport, accommodation, fee etc. It is unlikely that it would cover all of these, depending on the specific case. Medea will work with accepted residents to find the most appropriate way to use the limited budget available in each individual case. Working in fields including music, video, design, painting, multimedia, robotics, interactive technology and media production, we allow the integration of our distinctive areas of research and practice to define a unique style in the realisation of collective projects which range from multimedia theatrical plays to experimental audio-visual shows, and from improvised noise music through to field recordings and electroacoustic composition. Please use the contact form primarily to apply for this open call. Should you have any problems with submitting your application please send it to us by email to info (a) medeaelectronique.com complete with requested documentation. Thank you! Do you work with image or sound? I have read the details about the residency (to the left).